The Invicta Angel (1613) is an attractive watch that fits comfortably and stands up well in the daily routine. It’s cheerful color scheme makes it a fun addition to almost any outfit, but is it worth almost $500.00? This casual-wear timepiece has a light purple, rubber strap measuring 8 inches long and 15mm wide. It’s secured with a stainless steel buckle clasp. The Angel’s stainless steel case measures 30mm in diameter. It has a push/pull crown and snap-down case back. Its unidirectional bezel is made from a matching, light purple plastic which finishes the look nicely. 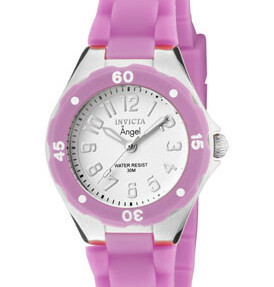 The Angel’s light purple band is made of rubber and finished with a stainless steel buckle clasp. Invicta stives to keep even their casual watches high quality. Japanese quartz movement keeps this watch reading time precisely. Invicta’s signature flame-fusion crystal makes it more impact resistant, and the Angel is also water-resistant down to 30 meters (99 feet). Normally you’ll find the Invicta Angel retailing for $495.00, but the watch can be found online for $371.25 and sometimes as little as $89.99. While you may prefer to try the timepiece on first, I’d suggest checking sites such as WorldofWatches.com, WatchesonNet.com, and Amazon.com for deals before you buy. 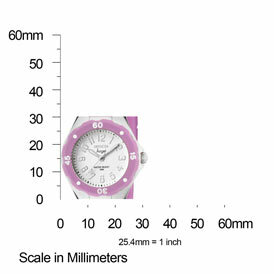 The Invicta Angel’s case measures approximately 30mm in diameter. The Invicta Angel (1613) works well as a casual or active wear watch. The rubber band fits comfortably and flexes with you as you move. It’s bright color scheme and classic round case make it a cheerful accessory to almost any outfit. Of course, that doesn’t include evening wear. If you’re just looking for a little splash of color and a classic style in a quality watch though, the Angel will definitely get the job done. Silver arabic numerals on white face give the Invicta Angel a cool, stylish appearance. However, the lack of contrast could make it difficult to read if you have poorer eyesight. Invicta balances this out with white arabic numerals set against the light purple bezel. These frame the dial and mark the quarter hours. In addition, the Angel has luminous hands to increase visibility in low light conditions. The stainless steel case and buckle combine with the flame-fusion crystal and water-resistance to make this a pretty durable timepiece. This is not a cheap, plastic watch. The Invicta Angel should easily stand up to your daily routine without damaging or loosing its time precision. 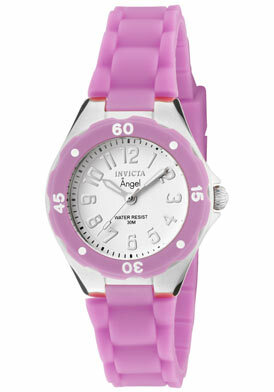 While it wouldn’t suit more formal wear, the Invicta Angel would certainly wear well with most casual outfits. It’s comfortable fit and attractive design make it an easy choice in the morning. For the Invicta quality, $495.00 really isn’t a bad price; however, I’d still consider shopping online. If you can find this little beauty for closer to $350.00, snap it up!